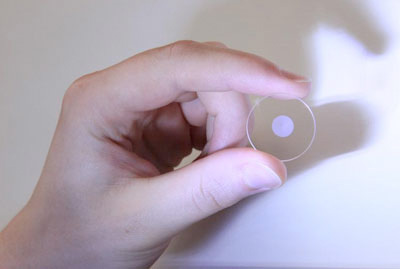 Superman's "memory crystals" have flown out of the realm of fiction into fact now that boffins have found a way to store 50GB of data in a disc of glass no bigger than the screen of a basic mobile phone. The memory is highly durable. It is able to survive heat of up to 1000° C and is resistant to the knocks and bumps that would do for a hard drive. Researchers from the University of Southampton use a powerful laser to etch "nanostructures" into a thin sheet of glass. Each nanostructure is a cube roughly one micron in size and consists of platelets about 10nm in thickness which are separated by 100-200nm of space, Professor Peter Kazansky and Martynas Beresna told Reg Hardware. When polarised light is passed through the structure, characteristics such as its radial and azimuthal polarisation - essentially, the angles at which the light wave oscillates - change. The data is read by measuring degrees to which the output light differs from the light entering the storage structure. Each characteristic encodes a different data set, so it's possible to store multiple data sets in the same structure. Enough to hold 260GB on a disc the size of a regular CD, the boffins told me. This data can be erased and rewritten with the laser too. Decoding the light that has passed through the cell is tricky, though, and the team says much of the work going forward will attempt to simplify the system sufficiently enough to enable it to be commercially viable to produce. The team is part of an EU project called Femtoprint, which is committed to building a shoebox-sized machine able to 'print' data in glass and which anyone can use.